If you’re designing a hydrotherapy pool, then make sure you include these factors of the hydrotherapy pool room design in your drawings and plans. Just like a typical swimming pool, your hydrotherapy pool room will also need a plant room, filtration system, and some kind of environmental control to provide air heating and dehumidification. Here are a few extra things you can bear in mind when planning your hydrotherapy pool room design. Just like with any large structure, you need to make sure that the foundations you’re laying your pool on are designed to withstand both the weight of the pool structure as well as the additional weight of the water. For stainless steel hydrotherapy pools, you want to use a concrete slab. The depth of the slab and the grade of the concrete should be calculated by a structural engineer. Always make sure that these are strong enough to withstand the weight of the pool – particularly when it is full of water! It’s also important to ensure that the base slab is completely level, although the stainless steel structures are able to be levelled, if the base slab is badly out of level, it can mean that the height of the pool ends up being higher then the pool floor meaning additional screeding is required. Whereas swimming pools tend to slope so you have a shallow end and a deep end, hydrotherapy pools are often completely level to help people carry out physiotherapy. Where a slope is required for a hydrotherapy pool, the slope is formed within the stainless steel structure not the supporting base slab which it sits on. It’s worth bearing in mind that there might be other guidelines and regulations when installing a concrete and tiled pool relating to the waterproofing and strength of the retaining walls, but with stainless steel hydrotherapy pools, these standards aren’t an issue as the pool is a totally self-supporting, watertight structure. The external sides and base of the pool are insulated using spray insulation in order to comply with Part L of the current building regulations. Just like a swimming pool, your hydrotherapy pool will need a plant room fairly close-by to house all the equipment required to maintain the pool in good working order. Typically this will consist of filters, pumps, plate heat exchangers, a chemical dosing system, the chemical day tanks and the control boards. The plant room can be built below ground if necessary. The size of the plant room depends on the size of your pool. See the table below for a loose pump room size suggestion. Depending on the size of the pool, a plant room needs to be big enough to accommodate the right size filtration system. If you ever walk into a room with a hydrotherapy pool, the first thing you’ll notice is how warm it is. That’s because hydrotherapy pools typically run a lot hotter than a traditional swimming pool, generally between 32 – 40°C. But this also means that the room itself gets a lot warmer and more humid because there’s more water evaporation from the pool itself. The problem you have is that you don’t want an uncomfortably warm room, but you also don’t want to be pumping freezing cold air to level it out because that can make it even more uncomfortable for people using the pool. To help prevent any damp or corrosion that could be caused by humidity, you’ll need to install an environmental control system that dehumidifies the room. This will remove any humid air and will pump in warm, dry air. The air temperature in a hydrotherapy pool should be maintained 1 degree below the pool water temperature. The environmental control systems can either be installed as a ducted system with supply air vents positioned in the floor or ceiling, the vents are generally positioned in front of any glass such as windows and doors to prevent condensation build-up, or as a simpler wall mounted system with single extraction and supply vents. You will always need some sort of environmental control system but get in touch with a hydrotherapy pool specialist to determine what’s the right setup for you or your client. 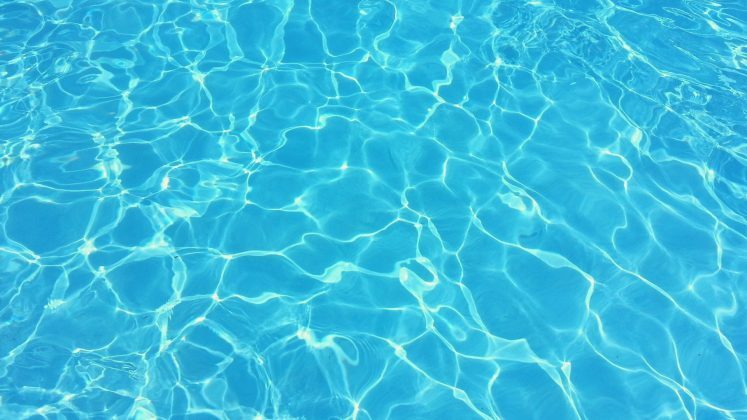 Hydrotherapy pool water can be filtered usually through a skimmer or an overflow system. It very much depends on what your client’s preference is as to which system you choose. For an overflow filtration system, you will need a balance tank to contain the water that has come out of the pool. Overflow filtration tends to look more like an infinity pool once it’s all installed. Skimmer filtration systems are more commonly used in public swimming pools and such. Skimmers are set about 25mm down from the top of the pool wall and the water level should be about halfway in the mouth of the skimmer. For the filter media, there are several different types that can be used in your filtration tank to help clean the water. But we highly suggest using activated glass filter material. We use this in our hydrotherapy pools, and it’s specially designed to have 30% more surface area than sand or standard crushed glass. Because of the larger surface area, you can filter out any debris or bacteria a lot more effectively which helps reduce the chances of cross-infection between users. For a hydrotherapy pool the filtration system must be capable of turning over the full water volume every 45 – 60 minutes and it is therefore suggested that you wait 60-90 minutes between users for a complete turnover of the water. These are the main things to consider when you’re planning a hydrotherapy pool room design – other than the hydrotherapy pool itself! Use this a guide next time you’re designing a hydrotherapy pool room and see if it helps you get a better idea of dimensions and guidelines. Stuck for an answer? Ask our team! Hydrotherapy pools for SEN schools have a few different things to a typical hydro pool. Here's a few things to look out for when designing one for a school!